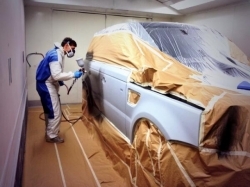 St. Annes Bodywork Centre are a family run business with more than 15 years experience in the car bodywork and accident repair sector. The business was originally started by 'dad' Alan Cross and son Paul. 2 years later John joined the family business. We understand that choosing a company to repair your vehicle is not always an easy task so we hope that by learning a little about us a company and as individuals you will feel more comfortable leaving your pride and joy with us to be restored back to a like new standard. Originally from Yorkshire Alan moved to Blackpool in the 90s. Naturally as with all the Cross family Alan has a keen interest in cars, especially classic cars. Alan enjoys holidaying with his wife Linda, spending time with his grandchildren and of course his beloved fish! Like his dad and brother, Paul has a large interest in cars especially classic 80s fords. Having recently become a dad Paul enjoys spending time with his son and girlfriend Nikki. Paul's other interests include car restoration, snowboarding and going to the gym regularly. Like all the Cross family John's interests mainly revolve around cars. Like his brother Paul, John is interested in classic cars especially classic 80s fords. John's other interests include golf, attending the gym and spending time with his son.